Hello, I am a 13 year-old SMW hacker, and someone who records Emergency Alert System alerts and make mock ones as a hobby (Although, you're here more for SMW Hacking, so I'll just go over that below). Level Design: I am somewhat good at level design, although I can also be bad at that sometimes. Even if a hack I made is almost at completion, or I am about to release a demo, I sometimes press Ctrl+Delete and try to make another level. ASM: I have no ASM knowledge, and I usually just use patches found in the patches section. I can edit patches by following any instructions given by their creators, but I can’t create my own patches, or even custom sprites unless I learn ASM. I might learn ASM sometime, if I have time, of course. Overworld: I know how to edit the overworld, but designing it is somewhat of a different story. Sometimes, most of the overworld maps I make are somewhat good, and some are not. 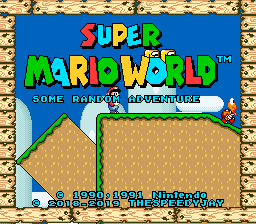 I can base some sub maps off of real locations, such as the Yoshi’s Island submap on “Super Mario World - Some Random Adventure." I sometimes make good main maps as well, and I actually stuck to one for Some Random Adventure, which is surprisingly good. My first hack. It is still in demo stage, and I'm slowly working on it. Already have the first and the second worlds done. You know 100% about SMW hacking! Ha! You got an A. That means... Eh, well I don't see many peeps that score so high, so I have nothing to say. I kinda think that they should update this quiz to be more updated with the more recent tools lol.